TUMX-C has 15 needles, 1 head, cylinder style, needle base LED lamp, 1200 spm, open frame, cubical body, wheels. 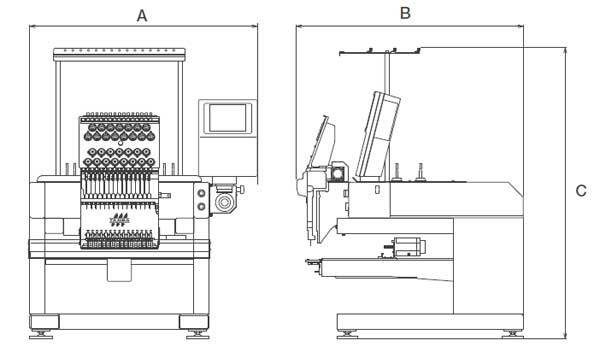 Tajima TUMX-C 1501 15-Needle Single Head Cylinder Embroidery Machine. Embroider Even Large Finished Goods with a New Design Cubical Body! The new cubical body design blends in well with its surroundings and is optimal for salesdemonstrations. Customized to embroider a wide-range of nished goods, includingT-shirts, blazers, caps and enamel sports bags. The area around the frame is wide open so the machine main body and the stand do notinterfere when setting frames. Even large size finished goods can be attached andremoved smoothly. The lineup consists of 2 types: a 6-needle type optimal forname embroidery and a 15-needle type for original designs.Names and original designs can be created easily withembroidery data creation software (sold separately). Needle Base LED Lamps illuminate the needle area and areequipped as the standard speci cation.